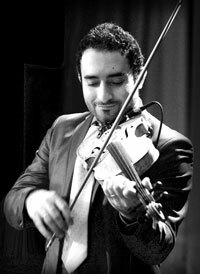 Born in 1979 in Arbil, Iraqi Kurdistan, Darvan Ahmad Abdulkarim worked as a violinist in Kurdistan Symphony Orchestra as well as for the kurdish televison (KTV) for six years before moving to Norway in 2003. At the same time he was also a member of a music group called Nali. Between 2004 and 2005 Darvan was active in Romerike Symphny Orchestra in Lillestrøm, and has been a member of Ellayali since 2009. Darvan adds flavour to Ellayali with his unique arabic sound and style of playing.